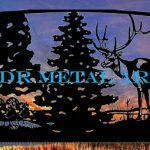 drive entry gates Archives - Custom Driveway Gates - Iron Steel & Aluminum - JDR Metal Art - FREE Standard Shipping! Need a driveway gate that would be perfect for also keeping small dogs in (and large ones out) ? 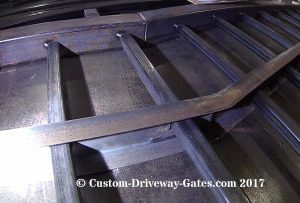 These driveway gates have 3/4″ square tubing pickets with a 4″ gap between pickets. 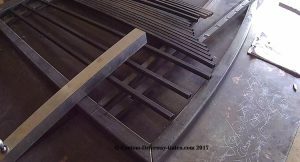 Along the bottom 9″ of the gate there are smaller 1/2″ square tubing pickets between every larger picket with a 1.75″ gap between large and small pickets. Each gate panel is 4′ tall on the ends and 5′ in the center. Punched steel channels add strength horizontally across the gate panels in two places; the bottom channel is fully flat and the top channel is both partially flat and partially arched. The pickets are expertly welded for a watertight seal. The gates are then sandblasted clean prior to powder coating for added adhesion and durability. 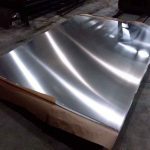 Our standard powder coat finish color is matte black although other colors can be arranged prior to ordering. 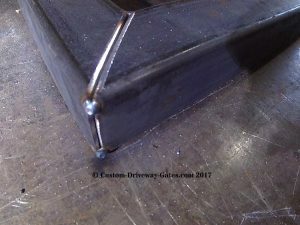 The bottom 9″ of the gate has a gap of 1.75″ between pickets. These dual swing drive entry gates feature a giant oak tree and are complimented by a pastoral farm scene background. The gates are 24′ wide overall between the posts. We built them for a cattle farm in southern Ohio. 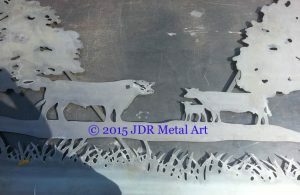 The background scene on these drive gate panels was cut with a CNC plasma cutter from 11 ga steel. There are three cows, a bull and a calf depicted in a wooded pasture. 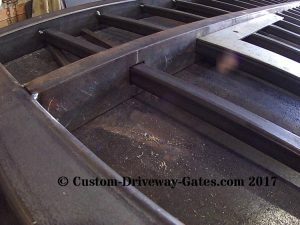 The CNC plasma cutter leaves a smoother edge than our hand cut gates but there is no real difference once the panels are powder coated because the powder coat has a tendency to build up on the cut edges, thereby rounding these edges anyways. 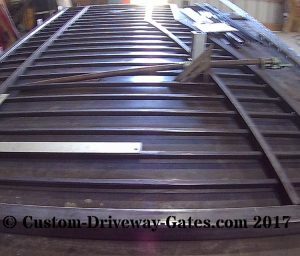 We built these drive entry gates to accommodate an Apollo 1650 ETL solar powered gate opener system with remote entry, keypad entry and automated exit sensor functions. We have always been impressed with the craftsmanship of these particular openers and would recommend them for nearly any application. We upgraded to an oversize solar panel to absorb sunlight at a much faster rate than a smaller solar panel. These drive entry gates are towards the bottom of a valley so the sun is not in line of sight for more than a few hours everyday. 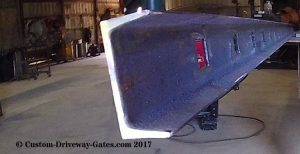 The battery holds enough charge to operate the gates approximately 300 cycles before needing to be recharged. The solar panel charges the battery back up to full in just a couple of hours, even on an overcast day. 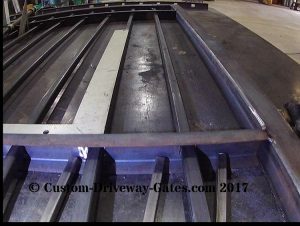 We customize our drive entry gate designs for each and every individual project in order to meet the needs of the individual client. This particular client raises cattle and wanted them to play a dominant role in the overall design. We also design drive entry gates featuring horses, wildlife & much more!